Imraan Shirazi with proud dad Akif. Young Peterborough boxer Imraan Shirazi picked up the best win of his short career when becoming Bristol Box Cup champion at the weekend. 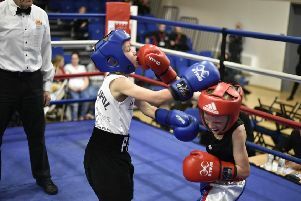 The 11 year-old Peterborough Police Amateur Boxing Club rising star from Bretton won the 2005-born 34kg title in the prestigious tournament which attracts the best boxers from all over Great Britain. Shirazi fought Welsh open class champion Codi Leamon from Chepstow and celebrated an emphatic win, outclassing his opponent in all three rounds. Leamon came out with all guns blazing and didn’t stop throwing punches throughout the fight but Shirazi’s strong defence and counter-attacks were too much for his opponent. It was a very skillful performance from a clever young boxer who impressed the judges to get a unanimous points win. Shirazi, who goes to Ken Stimpson Community School, has had a busy season boxing all over the country and has been training very hard most nights and boxing at weekends. His dad Akif Shirazi , who is also one of the club coaches, said: “Imraan has a great work ethic when it comes to training. Boxing is his passion but he also understands the importance of his education and knows school work comes first. Shirazi boxes again this weekend in the 2017 Hull Box Cup. This is another Olympic style, open class, tournament held over three days with over 400 boxers from the UK and Europe taking part. Head club coach Chris Baker said: “Imraan is a rising star and is definitely one to look out for. “It’s currently the end of the season but I’m keeping the lads busy. “Three members will also be competing in the Irish Monkstown tournament at the end of June. “If any local businesses want to come on board to sponsor the club or a particular boxer, then please contact me on 07921095122.